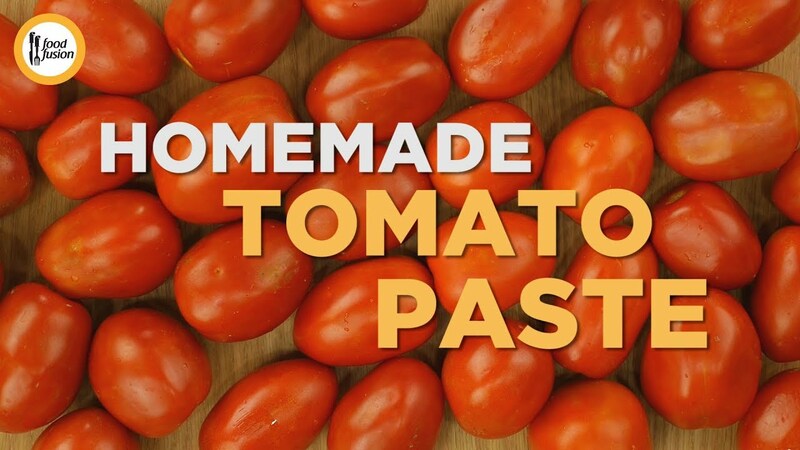 -In grinder,add tomatoes and grind well until pureed then strain the whole puree with the help of the strainer. -In pot,add tomato puree,bay leaves and mix well then cook on medium low flame for 20-25 minutes and keep stirring in between. -Add sugar,salt and oil,continue mixing and cooking until it reduces to half quantity (15-20 minutes). -Remove bay leaves and continues mixing and cooking until it becomes a thick paste. -Can be store in ice cube tray for up to 60 days in freezer. -Can be store in airtight jar for up to 10 days in refrigerator. -Grinder mein tamatar dal dein aur ache tarhan grind ker ka puree tayyar ker lein phir puree ko strainer ki madad sa strain ker lein. -Pot mein tamatar puree aur tez paat dal ker ache tarhan mix karein aur halki darmiyani ancch per 20-25 minutes kliya paka lein aur bech bech mein chamcha chalatay rahein. -Cheeni,namak aur oil dal dein aur musalsal chamcha chalatay rahein aur adhe quantity reh janay tak paka lein (15-20 minutes). -Tez paat ko nikal lein aur garha paste tayyar hunay tak paka lein aur musalsal chamcha chaltey rahien. -Paste ko thanda ker lein. -Ice cube tray mein dal ker 60 days tak freezer mein store ker saktay han. -Airtight jar mein dal ker 10 din tak refrigerator mein store ker saktay han.